Rev. 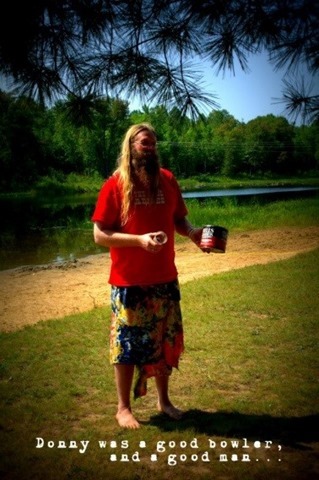 Austin “Auz” Lawrence sends us this report on the fun and games, as well as a healthy dose of Dudeist philosophy, to be had at the first ever LebowskiCampFest. 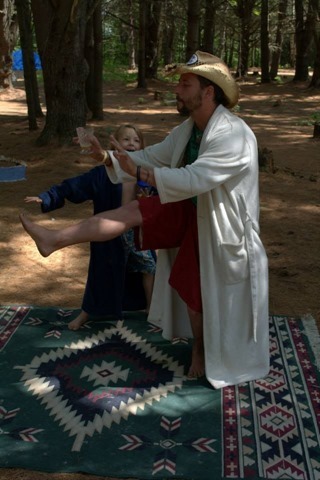 Attendees channelled their inner-Dude, and in the spirit of abiding had a very unigue camping experience. LebowskiCampFest seems to have been a fantastic success, Rev. Auz and friends are true achievers, and proud we are of all of them. Brothers and sisters! 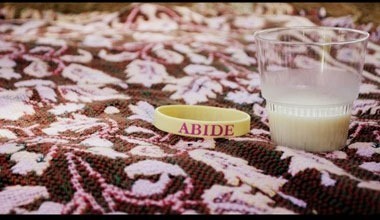 We have heard the Word, and it is “Abide.” The Raven’s Knoll congregation of the Church of the Latter-Day Dude held a tent revival to learn from, and apply, the teachings of the Dude. The first LebowskiCampFest was held from August 9 to 10, 2014 at Raven’s Knoll campground near Eganville, Ontario, Canada. This fest is a camp out where we commune with the wisdom of the movie the Big Lebowski on the weekend of August 9 and 10, 2014. Raven’s Knoll is home to Canada’s largest Pagan gathering, the Kaleidoscope Gathering (KG), held around the August long weekend every year. The Pagan community in Canada are really laid back and recognize a good ethos when they see it. Around these parts, over the years, the theology of Discordianism has been popular, as has the Church of the Sub-Genius. But now that we have heard the word of the Church of the Latter Day Dude, the evolution of introspective hilarity and slack has reached its logical theological zenith. 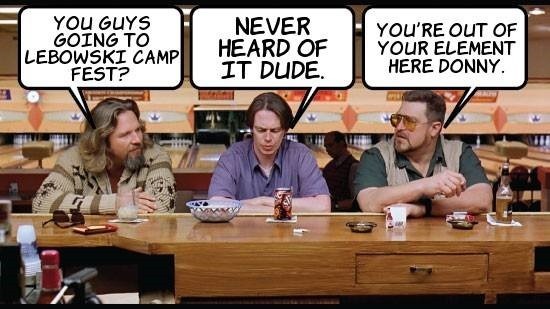 Although, LebowskiCampFest was established as a weekend for volunteer staff to chill after KG, it was indeed created by a bunch of event organizers. Thus, like a Dude getting wrapped up in events beyond his control, we could not help but organize lots of awesome stuff to do. 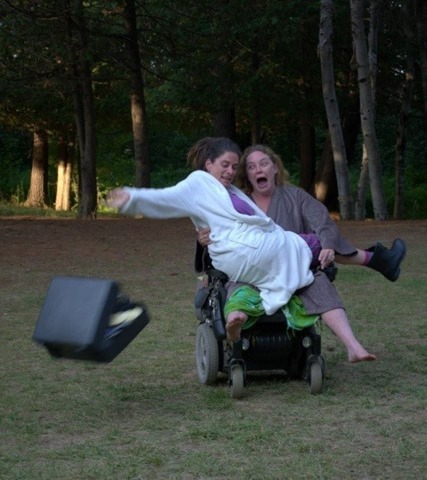 The opening ceremony on Friday evening was a “Suitcase Toss.” Adventures begin in the simplest ways. Ours, like that of our Prophet, started with a simple tossing of a suitcase filled with undergarments. 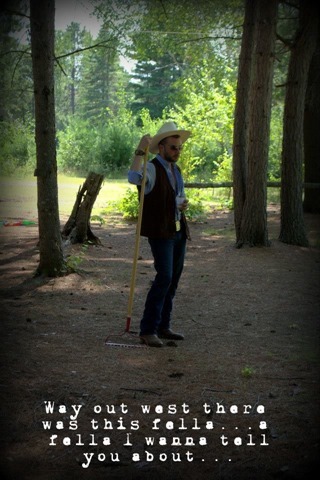 Everyone had a chance to throw the Ringer, either from the campground’s golf cart or from Rev. Myst’s motorized wheelchair. We felt that everyone needed to get prettied up like Bunny, so there was then the opportunity to get “Green Pedicures” from Rev. Dood B. Here and Rev. Brynn. Toe nails should be green. Hedonism demands it. That evening, after people had set up their camp and had a few beverages, we collected everyone together and stepped away from the campfire into the darkness. As you know, there is no sweeter sound in all existence than the song of whales (except maybe the sound of bowling). Whales are the opposite of the Eagles, man. Our evening rite involved joining Rev. Auz to listen to the songs of the humpbacked whale while meditating on readings from the second sacred text of Dudeism, “The Dude De Ching.” Everyone turned their eyes towards the shining vault of stars above our heads and we cranked 20 minutes of whale songs at full volume to fill the forest with their relaxing, mournful trilling and clicks, as we contemplated the wisdom of Taoism as digested through limber minds and the tropes of the Cohen brothers. On Saturday morning we arose at the crack of noon. As Dudeists we recognize that a place is a home when you have a rug to really tie things together. Priests of Lebowski, Rev. Døøð and Rev. Brynn, took Achievers into the woods to arrange rugs, to come to an understanding that all of the world can be the home of a dude. We had a bit of fun doing a photo shoot with everyone and voted on the best costume. Rev. Gypsy won the costume contest with his excellent renditions of The Stranger, Buddy Face Down in the Muck, and Walter. (Not only were his costumes great, but like a good Dudeist, he ensured there was a Trinity of them.) The most popular costume amongst Achievers was the bathrobe of the Dude and of Maude. In fact, some people are still wearing them, I think. The best costume winner received two prizes: the acclaim of the Achievers AND a saintly bottle of homemade coffee liqueur from whence the sacred draught is mixed. Even if there are no lanes, a Dude can still bowl. Never quit the tournament, even if you have no lanes! It is by struggle with our foes and interactions with our inner narrator that we learn what is truly possible. During the daytime a few of us did a little “Cowboy Bowling” while drinking some oat sodas, while Lebowski-ites looks on. We felt that this was only fair. In the movie, the Stranger has to watch all the bowling, but never play. So, we played horseshoes, which is kind of like the outdoor equivalent of bowling. At the very least, it put us in a Dude frame of mind. Our local congregation of the Church of the Latter Day Dude has been influenced by the traditional teachings of the Holy Spirit Association for the Unification of World Dudeism (commonly known at the “Dudeification Church” or in the media as “The Doodies”). 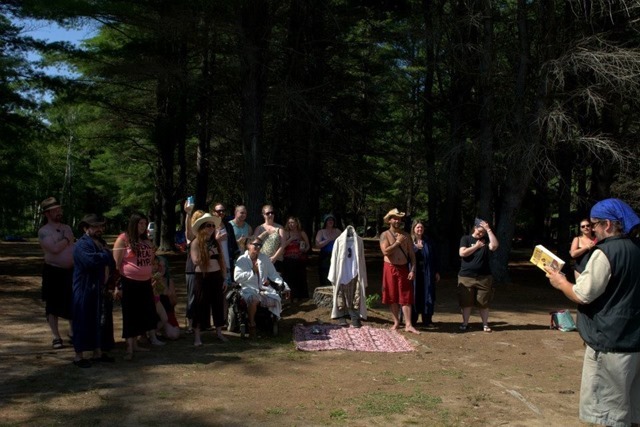 So it was natural that we held a mass ordination of Dudeist priests. Everyone took the oath from “The Abide Guide” together, at the same time, right beside the Travelling Shrine of our Perpetual Dude. Rev. Døøð, Arch-Deacon of Swedish Log Bowling, then printed out ordination certificates for eighteen new priests and priestesses of the Church of the Latter-Day Dude. All of this was rather thirsty work, so we proceeded on to “Sacramental White Russian Mixology & Tasting.” Praise the mixing of the opposites – opaque and clear, hot coffee and cold ice, white and black, stimulant and depressant. 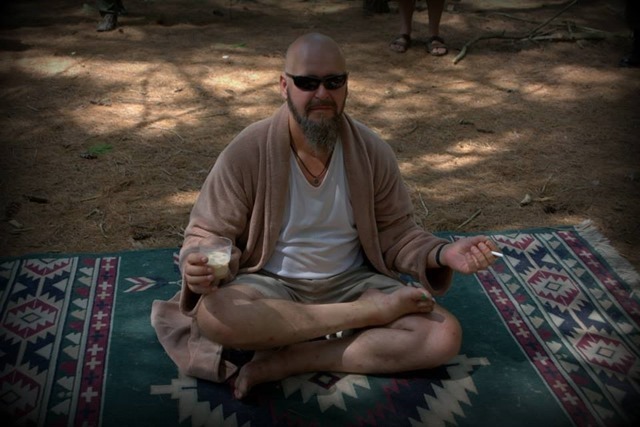 As we all know, the White Russian is the sacramental drink of Dudeism. Priests of the Church of the Latter Day Dude, Rev. Dood B. Here and Rev. Doug, held a service to demonstrate how to make coffee liqueur from scratch and how to mix the perfect White Russian or closely related beverage. People brought their own ingredients and shared them, creating the “White Pirate” with coconut milk and rum for the lactose intolerant to “Blind Russian,” using Bailey’s instead of cream. No matter what the Interwebz or bar guides say, we Canadian Dudeists decry that using goat’s milk does not a “White Canadian” make. It was the consensus that a true “White Canadian” is made from coffee liqueur, half and half, and maple syrup whiskey liqueur. 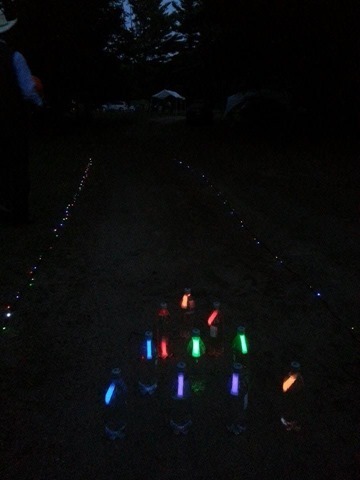 After the movie was finished someone set up “Night Bowling.” We used a fluorescent volleyball as the ball, sets of fairy lights as lane markers, and put glow sticks in plastic pop bottles full of water for pins. It was exceedingly trippy, man. The Achievers eventually congregated around the bonfire. (Jackie Treehorn knows what people want at a party, eh?) Their minds were getting limber and the conversation was flowing. Into that reverie, Rev. Zau the Nihilist reminded everyone of the flip-side of Dudeism by leading people in some “Nihilist Stargazing.” The stars are harsh teachers. Seemingly happy and twinkling they are actually light that comes from exploding collections of matter that died billions of years before our world was even created. We people are just a tiny speck in all that existence, that existence that ends without hearing our thoughts or recognizing our efforts. Rev. Zau the Nihilist read a selection of existentialist philosophy to everyone while they contemplated the futility and nothingness in the vastness of the starry sky. On Sunday, everyone had to pack up to go home. To end the event a “Scattering of the Cremains” ceremony was held. At the end of the adventure, there is always still a chance to be with friends one last time and remember the good times. Our closing ceremony, as taught by the example of our Prophet, was an ending with memories shared around the scattering of cremains (in this case, the ashes from our communal campfire). That’s a lot of people abiding, man. I dig it. can’t beat yr after yr abidance!